NETWORK FINALS: The CHICAGO MED and CHICAGO FIRE reruns each lost 0.1 in final numbers. CABLE HIGHLIGHTS: VH1 led Wednesday cable with twin 0.49s for LOVE & HIP-HOP (up 0.11 from last week) and BLACK INK CREW (up 0.08). Bravo’s REAL HOUSEWIVES OF NEW JERSEY was steady at 0.48. On History, the season finale of VIKINGS rose 0.07 to 0.46 (down 0.07 from last season’s finale), and KNIGHT FIGHT was down 0.03 to 0.16. ESPN’s NBA doubleheader was at 0.43/0.33. 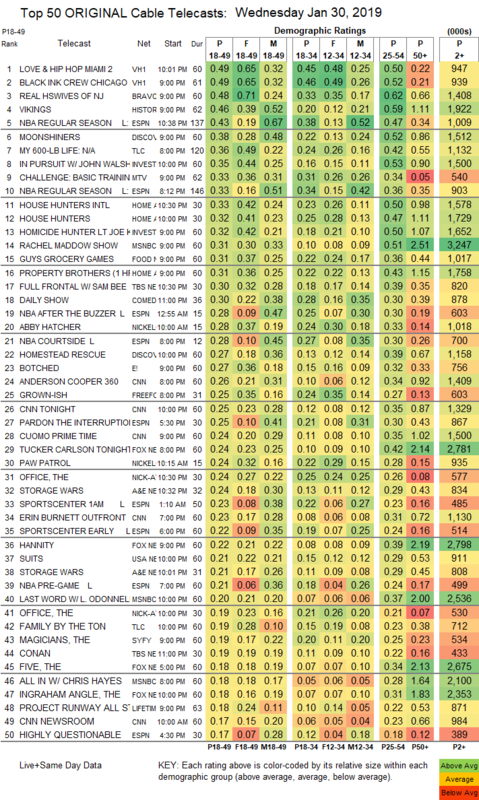 On Discovery, MOONSHINERS gained 0.04 to 0.38, and HOMESTEAD RESCUE was up 0.05 to 0.27. On TLC, MY 600-LB LIFE put on 0.02 to 0.36, and FAMILY BY THE TON was down 0.03 to 0.19. On ID, IN PURSUIT climbed 0.03 to 0.35, and HOMICIDE HUNTER was down 0.03 to 0.32. MTV’s THE CHALLENGE returned at 0.33. On HGTV, HOUSE HUNTERS INTL jumped 0.12 to 0.33, HOUSE HUNTERS was up 0.09 to 0.32, and PROPERTY BROTHERS gained 0.06 to 0.31. MSNBC’s RACHEL MADDOW SHOW led cable news at 0.31/0.51/3.2M, with CNN’s ANDERSON COOPER 360 at 0.26/0.34/1.4M, and Fox News’s TUCKER CARLSON TONIGHT at 0.24/0.42/2.8M. Food Network’s GUY’S GROCERY GAMES rose 0.09 to 0.31. TBS’s FULL FRONTAL lost 0.04 to 0.30. Comedy Central’s THE DAILY SHOW was in the Top 20 at 0.30. Nickelodeon’s 10AM ABBY HATCHER was there too at 0.28. E!’s BOTCHED was at 0.27. Freeform’s GROWN-ISH grew by 0.04 to 0.25. A&E’s STORAGE WARS was at 0.24/0.21, compared to last week’s 0.21/0.20. USA’s SUITS dropped 0.05 to 0.21. 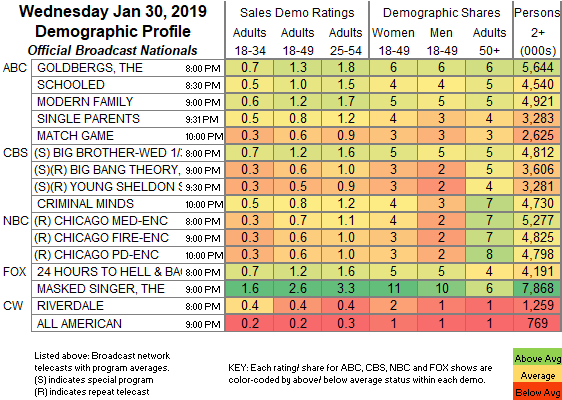 On Syfy, THE MAGICIANS was steady at 0.19, and DEADLY CLASS was up 0.02 to 0.15. On Lifetime, PROJECT RUNWAY gained 0.03 to 0.18, and AMERICAN BEAUTY STAR ticked up to 0.09. On TNT, DROP THE MIC ticked down to 0.15, and JOKER’S WILD was down a tick to 0.11. Tru’s I’M SORRY rose 0.05 to 0.12. FXX’s YOU’RE THE WORST gained 0.02 to 0.10. POP’s SCHITT’S CREEK gained 0.02 to 0.07. WGN’s PURE was off the chart, down 0.03 to 0.04/277K.